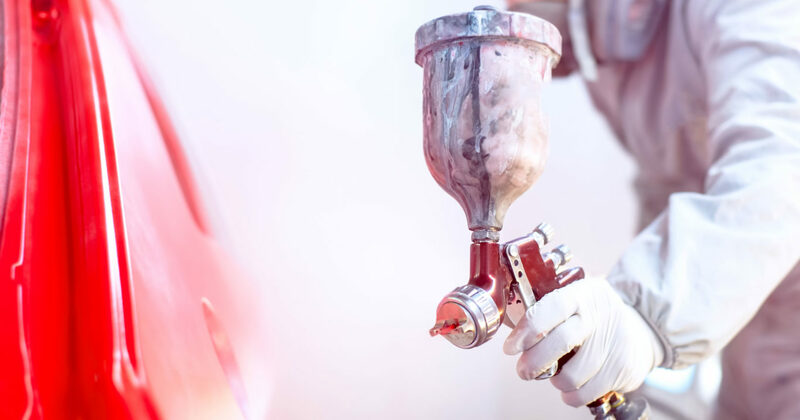 Matching your vehicle’s paint for repairs is equal parts art and science. When you bring your vehicle in for a repair that requires a re-paint, like a bumper repair, the best way for us to do the repair without breaking your budget is to only repair the area that has been damaged. To avoid painting complete sections of your vehicle over again to fix a simple scrape, we need to get a perfect match to your vehicle’s original colour so that the finished product looks absolutely perfect, even under close inspection. First a little background. Auto manufacturers create a “standard” for every color that they put on their vehicles and they send that out to all the auto body paint suppliers to create a matching formulation. The individual paint companies then have to attempt to match their paint to that “standard”. Car manufacturers are not loyal to any particular paint manufacturer; instead they may switch suppliers at any time to reduce their price or increase their quality. The manufacturer will buy a certain volume of paint and when it’s gone they will get new bids for more of the same colour. Also worth noting is that conditions in the plant will vary from day to day temperature, humidity, how long the paint has been flowing through the system…and this will create variations in the colour even in cars of the same year and paint code. When you bring your car into Island Color, we start by getting your vehicle’s paint formula from the driver’s side door area. This gives us the starting point for what colour we need to do a perfect repair, but that is only the beginning. When paint companies create a formula to match the “standard” they will also create “alternate” formulas to match known variations in the paint on cars coming from the car manufacturers. Some paint codes will have many, many “alternates”, while others may just have one or two. For example, Toyota’s Desert Sand Mica (4Q2) has a “standard” formula and 13 “alternate” formulas. We are able to see these shades in the form of cards from the manufacturer. They show all of the alternates for your paint colour and let us do an eye test to see if your vehicle is far enough away from the original formula to warrant a different shade to be used. If the colour is very difficult to match, in a rare circumstance, or if your vehicle is a one off or a repaint from a different shop, we may need to make use of a paint matching camera to make up a special batch of paint just for you. Once we have decided on a formula we move to our computer software to mix up the perfect batch of paint. We input your formula code and it spits out a perfect recipe of different colours of toner by weight to add to our base to create the correct shade for your vehicle. The art of painting comes next. The easiest thing to do would be to just paint the entire panel that needs repair. If you scrape your bumper on one side, we could paint the whole thing. The problem is that paint is very expensive, and to do this we would need to triple our prices. What we do instead, is employ the best colour technicians who are masters at blending new paint into your existing finish to make a seamless blend of old and new. This is how we are able to repair your bumper, rocker panels, and chips for less than your deductible and without increasing your insurance costs. Sometimes a customer really wants their rims to be painted Ferrari red, but we don’t have anything to match to get that paint colour. In those cases, it is actually really simple. Our software gives us access to paint formulas for every vehicle EVER MADE, so we can grab a colour from an old favourite or new classic and paint any parts you want to match it. The future is here and it makes customizing your car easier than ever before.